Here is my response to NetflixFan wondering why her four movies are taking so long: Three of the four movies she is waiting for passed through my hands in the last week. Granted we have different distribution centers, but still deserves a smile :). How many movies have you seen this year? 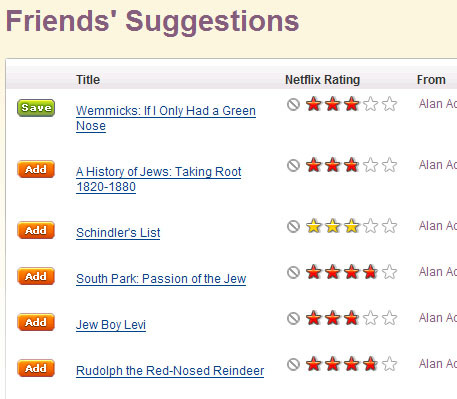 This question was posed on Hacking Netflix because Becky just blogged how she has watched 200 already this year. My count so far was 96. In comparison, I only watch about 3 shows on TV a week totalling about 2.5 hrs on TiVo, and I have been to the theater about 3 times. That would put me at about 21 movies per month, 5.3 per week and about .7 movies per day. 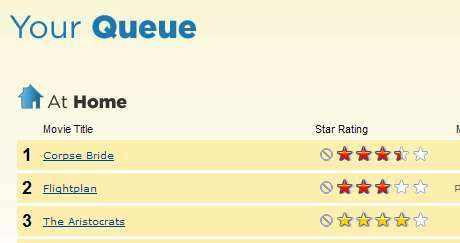 Posted on May 19, 2005 Author ScottCategories Netflix, Personal, TVLeave a comment on How many movies have you seen this year? 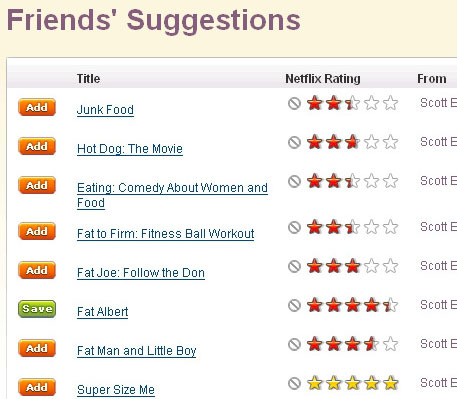 I thought it would be funny to make fun of my fat friend by sending Netflix suggestions to him of every movie I could think of with either “Fat”, “Food”, or a name of a food in the title. I thought it was pretty funny. Pretty frickin’ hilarious. And yes I am Jewish, and yes I have a big nose.